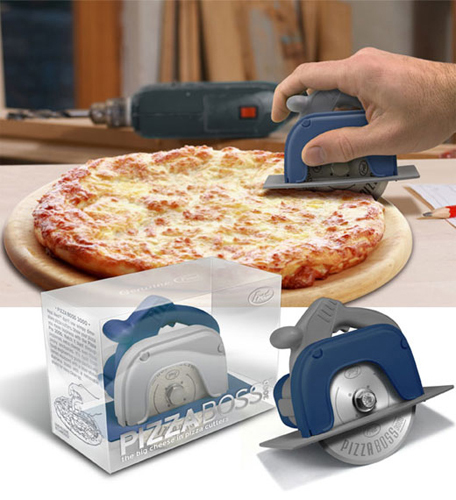 Show Your Pizza Who's Boss With This Cutter | OhGizmo! Smiles:-) Wheels Make Rolling Furniture Fun! By Chris Scott Barr on 03/03/09 • Leave a comment! I’ve been needing to get a new pizza cutter for a while now. I’m not sure what happened to the last one, but I’ve been using a large butcher knife to slice up my pies. As crazy as it sounds, it really does a great job, which is why I haven’t bothered replacing it. Perhaps this new Pizza Boss 3000 is exactly what I’ve been needing. This spiffy pizza cutter has been ingeniously crafted to look just like a small circular saw. I suppose this has been done to make you feel more manly whilst cutting your pizza. For $15 it’s kinda cool, but would be so much better if the blade actually had some power going to it.